Federal regulators on Monday charged Dallas Mavericks owner Mark Cuban with insider trading for allegedly using confidential information on a stock sale to avoid more than $750,000 in losses. 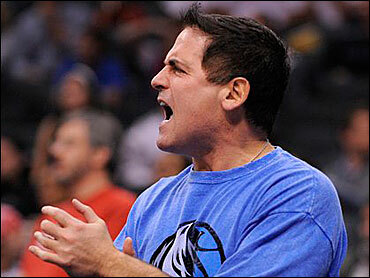 The Securities and Exchange Commission filed a civil lawsuit against Cuban in federal court in Dallas. The SEC says Cuban committed fraud in 2004 when he dumped his entire stake - 600,000 shares - in the web site Mamma.com after learning the company was about to raise money by offering shares to private investors - at a discounted price, reports CBS News Chief Investigative correspondent Armen Keteyian. The next day, when the news became public, shares in Mamma dropped more than 10 percent, allowing Cuban, the SEC alleges, to avoid more than $750,000 in losses. "If what the SEC alleges Mark Cuban did is true, it was the most colossally stupid insider trading move ever," says Megan Barnett, News Editor for Portfolio.com. That would be surprising since two years ago the brash, brilliant entrepreneur launched a web site designed to expose corporate fraud. But it would also be a part of the mad, mad world of a maverick businessman, who exploded onto the sports scene in early 2000 when he bought the Dallas Mavericks, shortly after selling his Internet company for $5 billion. When he wasn't being fined more than a million dollars for criticizing NBA officials, Cuban was financing a cutting-edge HD network, or dancing with the stars. If found guilty of insider trading, Keteyian reports, the 50-year-old faces millions of dollars in penalties. In a statement today, he called the government's claims "false" and said he would fight the charges. According to the Wall Street Journal, Cuban sold his ownership stake after learning the search engine company was raising money through a private investment in a public entity, or PIPE. In a PIPE transaction new shares are issued at a discount to the current trading price, the newspaper reported. Unless he is subject to an injunction, Cuban "is likely to commit such violations again in the future," according to the SEC suit. Attorneys for Cuban in Washington and Dallas didn't immediately return telephone calls seeking comment.